How Does Weather Affect My Garage Door? / Comments Off on How Does Weather Affect My Garage Door? Maybe you’ve noticed that your garage door is tougher to open on particularly bad weather days, or that you struggle to close it at certain times throughout the day. That’s because different weather patterns can have a huge effect on your garage door. This is especially true here in Washington and Oregon, where the rain, snow and summer heat can do funny things to parts of your home. Here’s a look at how changes in weather affect how the garage door and garage door opener operate. 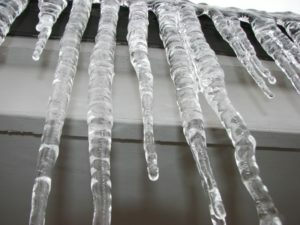 One of the biggest concerns during winter months is a garage door that freezes over. This happens when rain water pools or puddles near the door – if it freezes, it can cause the door itself to freeze shut, trapping your car inside. Keeping your rain gutters clear from debris is a good way to keep these pools and puddles from forming. Finally, broken springs are more common with cold temperatures than when the weather is warm, so it’s a good idea to monitor them and make sure they’re functioning appropriately. As you’ve seen, winter here in Oregon and Washington brings rain. Lots of it. If your door is made of wood, increased moisture can cause it and the surrounding framing to swell. If the door and the frame swell, the clearance between the two decreases and can cause the door to rub against the frame or even become stuck in place. It is essential to keep rain gutters clear to avoid run-off of water, which can splash onto your garage door when it hits the pavement and contribute to door swelling. Garage door openers are particularly susceptible to weather change. The moving parts in garage door openers operate best when lubricated. The weather can change the consistency of the lubrication, which affects the opening. In addition, if the sensitivity level on your opener is programmed to “light,” the motor may interpret thickened lubricant as the door hitting an object, which may halt the garage door or cause it to stop and re-open. Wall Switch Doesn’t Work: Sometimes the remote works fine but the wall switch will malfunction. If that happens, you may need to either replace the wall switch or the switch wires. In order to find where you are having issues, you will need to unscrew the switch from the wall and touch the two wires together (these wires carry a very low voltage and won’t create a shock). If the opener runs when the wires touch, your switch is no longer working. You have two options here: insert a doorbell button (if your opener is an older model), or purchase a new switch that is fitted with a light and locking option. Wall Switch Works But Remote Does Not: If the wall switch works but one of the remotes does not, it could just be an issue with the batteries. If you have replaced your batteries and are still running into a problem, you might need a new remote. If you cannot find the proper model online, consider a universal remote or look into installing a new receiver. Winterize a Garage Door: Maintenance to Do Now! Before winter, homeowners wrap pipes, repair the roof and put gardens to bed. But to winterize a garage? It’s not something people usually do. If your garage door is overdue for TLC, that means you’re taking it for granted. That’s not the best thing to do! Seal the Door: A seal won’t prevent a garage from flooding if you have improper drainage, but it will keep moisture from seeping in. Plus, a seal can maintain garage warmth and also keep out critters and other vermin. Sounds like something you need, right? Learn how to install a seal on your door here. Repair Leaks: Water could be getting into the garage for a variety of reasons, beyond just the seal. Read four different causes and fixes for water leaks in your garage. Lubricate Moving Parts: Adequate lubrication is important all year round. Lubing the moving parts on your door reduces friction which reduces wear and tear. This can help you save on replacements. All good stuff, but before you go wild with the white lithium, get the lowdown on how to do it right. How does hot weather affect my garage door? It’s not just rain and ice that affects your garage door; these balmy summer days can do the same. The Sun’s Rays: The direction your garage faces can have a strong effect on how the garage door and opener function. When the sun’s rays shine directly on your garage at certain times during the day, it can fool your garage door’s photo eyes into thinking there is an obstruction in the way, preventing the door from closing. The best way to counter this is either to simply wait it out or construct a small cover using paper or cardboard that deflects the sun’s light away from the photo eyes. Heat and Humidity: Like most electronics, the mechanisms that make your garage door go up and down can fail or malfunction in especially high temperatures. If you find that your garage is failing to open and close properly when it is particularly hot or humid, you may need to have some adjustments made in order to have it operate again as normal. Tip #1: Give Your Hardware a Tune-up: Garage doors get a lot of use and the hardware can undergo major wear and tear as the years go by. Every summer make a point to look closely at the door. Inspect the hinges, bolts and other moving parts. Tighten or replace bolts or hinges that are worn. While you’re at it, lubricate moving parts with a white lithium or silicone spray. Tip #2: Wash and Remove Rust: Summer is the best time to wash your garage door. Your door will not only look great, but washing will keep it working more smoothly by preventing a buildup of grease, dirt and grime. Use a mild detergent and water. Consider using a pressure washer if the door has significant buildup. If your steel door shows rust, you can sand away the damage before touching up with a primer and exterior latex paint. Tip #3: Give Your Door a Facelift: After you wash the door, freshen it up with new paint. When choosing paint, keep in mind that most doors look best when they blend in with a home. Don’t choose a color that draws attention to the door unless the door has architectural features you want to highlight. Instead, paint the garage the same color as the house. 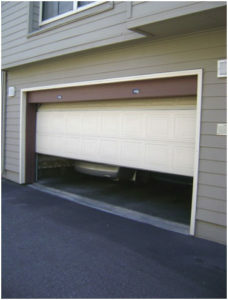 Last but not least, test your garage door regularly to see that it’s working well. Listen for weird noises, strange wobbles and missing hardware. Even if you never plan on repairing a door yourself, getting familiar with the normal function of the door helps you identify early when there are problems. Outside of summer and winter comes the stormier seasons in Oregon and Southwest Washington. This is an important time to make sure your garage is in top shape. Most years, Vancouver and Portland are buffeted by storms. 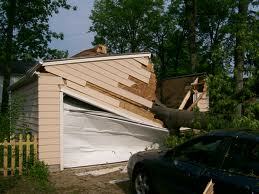 Wind is a huge issue, but this weather also brings down trees, which can damage your garage door. What to Do if a Tree Falls On Your Home: Here’s what to do immediately after a tree goes down. Don’t touch downed wires. If electrical wires are down, stay well away. Don’t touch the tree. Live wires could be hidden in the debris. Call the power company and the police. Don’t attempt to turn off the electricity yourself. The electric company may need to turn off power, especially if your home has been damaged by flooding. Before returning to your home, a licensed electrician should check out your electricals. Contact your insurance company. Homeowner’s insurance usually pays to fix tree-caused damage to homes and insured structures such as detached garages and fences. Many insurance policies will also pay for tree removal if the tree falls on an insured structure. Take photos from a safe distance. It could be some time before officials are able to investigate. Document the damage if you can. Secure your home. Your insurance company can help you find trustworthy contractors to temporarily secure your property. Agencies often have lists of prescreened contractors. Parts of your home may need to be boarded up.